Little Red and I have been having so much fun this week with our "Ghost Themed Halloween Unit". I seriously don't know who has more fun during our preschool learning time, me or Little Red. I have to say, going from having my own preschool, with two different classes, to moving and having just the memories, it has been quiet an adjustment for me. But, I have to say, having one "student", my daughter, has been just priceless. I will always cherish this special time we have with each other. Back to the post...This year I will be making an alphabet book with both of my girls. My 1st grader decided that she didn't want to miss out on the fun, and wanted to make one too. So, of course I said yes. I will be sharing each of my alphabet page ideas with you on my blog. I will have a link under my "All Things Wonderful Labels" on the right hand side of my blog, that you will be able to click on to see the alphabet book as it progresses. Each page will be unique and different, so check back often. Our first page of the year is our "G for Ghost" alphabet page. I saw these ghost footprints all over Pinterest, so I thought we would try one out ourselves. Little Red drew her own face on her ghost as well as stamped out the word "ghost" and the word "Boo!". I like it because even though the letters may not be stamped in a perfect line, it is perfect in my eyes because Little Red did it all by herself. 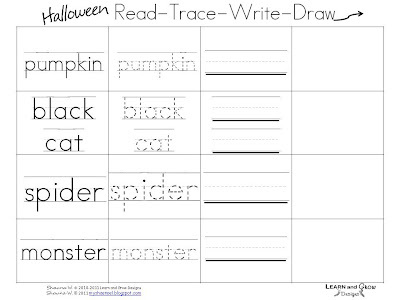 Another favorite activity of Little Red's was my "Halloween Read-Trace-Write-Draw" printable. For each Halloween word listed, "Little Red" sounded it out, traced it, wrote it herself, and then drew these adorable pictures. Aren't her drawings just darling? I am always amazed with her art ability since she just turned 5 a month ago. Her big sister is an amazing little artist as well. I can't wait to make more of these printables for our other themed units this year. 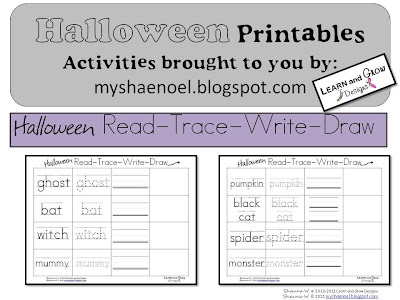 CLICK HERE for your own FREE copy of my "Halloween Read-Trace-Write-Draw" printable. Another activity we did was stencil ghosts on a piece of construction paper and then cover one of the ghosts with marshmallows. I really wanted to incorporate the letter "Gg" into our learning unit this week. We found the most darling book at the library to go along with our unit. It is called Mine! by Mathilde Stein. It is about a little ghost who sneaks into a little girls home and has a hard to sharing and being kind. Slowly the little girl in the story teaches the little ghost how to be kind, have fun, and share. It is a cute book with cute illustrations, and a good moral to the story. After we read the book Little Red had fun writing her own friendly ghost story. She wrote the first part of her story herself and then she dictated the rest of the story to me and I wrote it down for her. This is a cute writing project I used to use with my fourth grade class. Unfortunately I can't share the actual printable because of copyright reasons. It is basically a ghost cut in half and glued onto each end of a piece of Halloween themed stationary. To end our day we did the ghost page out of this fun "Usborne Spooky Sticker Book". I am in love with the illustrations in this sticker book. My girls love these series of books. Unfortunately this particular sticker book is currently out of print. 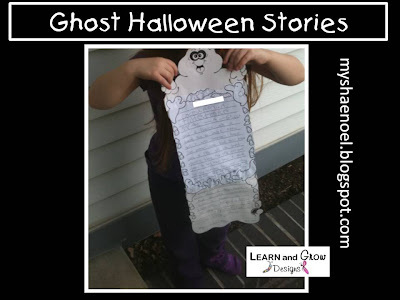 Don't forget to check out my other Ghost Themed Posts: "Golf Ball Ghost Addition and Printable", and "Ghost Paper Chain Halloween Countdown" and my other fun kid related"Halloween Ideas". Love the ghost footprint! What a clever idea. I haven't seen that before. I love the stencil cards! Your ghosts are so cute. You've got some great ideas! The ghost marshmallow page would be a big hit around here! I love all those print outs...my printer will kill me later. And the foot print is adorable! Come join us on Hey Mom, Look What I Did at Adventures In Mommy Land!! Halloween is such a terrific time for crafts. Love your ghosts, and we haven't read that particular book. Thanks for joining WMCIR! I love everything. So creative. So many fun things! Thanks for the printables - why reinvent the wheel, right? This post is wonderful! I will definitely use it! Thanks for following my blog!